the phrase 'to look a gift horse in the mouth' has never been one that i felt would ever apply to yours truly. long have i waited to happen upon the very opporchancity that would make my fortune, with a holiday home in the bahamas and a bank balance that ensured the manager would send me a calendar at new year and regularly invite me to cocktails in the lounge. it hasn't happened so far, and the likelihood of it doing so in the next few years seems remarkably slim. however, had i the strength of my own convictions and more than just a few words of spanish, last weekend might have offered the ideal situation. i am privy to the e-mail address of matt rendell, author of that book about marco pantani, as well as a particularly engrossing dissertation on the art of salsa dancing. matt was, at one time, the pr person for spanish world tour team movistar (and for all i know he might still be there); either way, he probably knows someone who knows someone, and last saturday i figured that's all it would take. for the lovely folks at scotland's endura cycle clothing had kindly sent a team movistar l/s jersey along with a similarly decorated gilet. since i was already in possession of team bibshorts and socks, i figured that a few hours under the sunlamp and a lack of shaving for a day or two would enable me to pass myself off as alejandro valverde, no longer a part of the tour de france due to a lack of stability on wet corners. my own record in that department remains unblemished. i figured that mr rendell could sneak me into the team bus and as long as i didn't come too close to nairo on the climbs, nobody would be any the wiser. surely a cunning plan indeed? 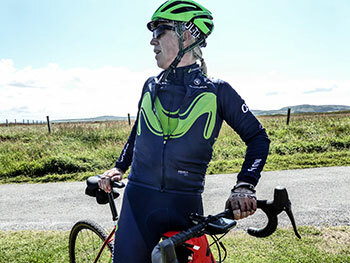 i base this surefire career move on the fact that the movistar team kit that can be had from any endura authorised dealer is identical to that found in the old mahogany wardrobe at the back of the movistar bus. granted, my climbing skills aren't what they once were, but on recent observation, that's a curtailment that seems equally applicable to nairo quintana. 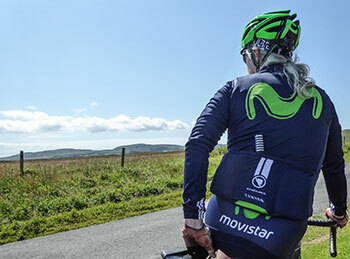 i have reviewed the long-sleeve movistar team jersey on a previous occasion and suffice it to say the current production is every bit as good as the original, with highly accommodating rear pockets, excellently judged sleeve length and just a few more endura logos than was originally the case. but the real objet de jour was that of the team gilet, a type of garment i find myself particularly enamoured with due to its unerring pragmatism and ease of stowage. 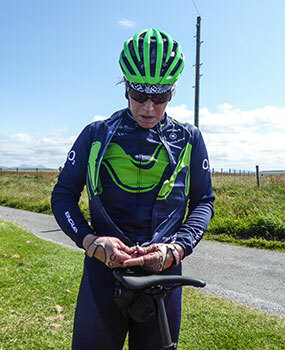 though perhaps not particularly relevant at present, even at the threshold of an hebridean summer, a gilet is the very item of garmentage poised to be worn on the oft-times chilly, early morning rumble to debbie's for the start of the sunday ride. by the time escape velocity has been achieved and maintained and those honed muscles are at operating temperature, it is simplicity itself to divest oneself of the gilet and unceremoniously scrunch it into a rear pocket beside the mini-pump. i have yet to meet a gilet that takes any of this personally. it is also serendipitous that we find ourselves discussing pocketry, for that is frequently the undoing of any self-respecting gilet. having stuffed everything bar the kitchen sink into the three jersey pockets, there then follows much huffing and puffing accompanied by a sucking in of stomachs in order to have the hapless gilet actually fasten at the front while accommodating the cyclist's equivalent of a bactrian camel at the rear. 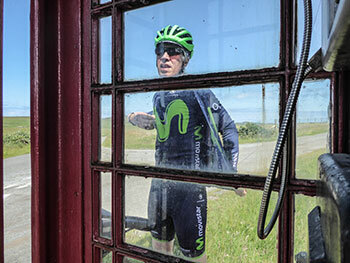 not so, however with endura's team movistar gilet, for it too bears three excellently sized rear pockets into which the aforementioned cargo might easily be placed. when eventual divestment proves necessary, 'tis but a simple matter to transfer the ballast to the jersey pockets. (prior to acknowledging that the movistar team gilet featured those pockets mentioned above, it is testament to the fabric's stretchability that i actually managed the above fastening exercise with scarcely a ripple of my six-pack). if i aver that the gilet's windproofing is up there with the best of its peer group, i'm sure you can trust me on that score, but aside from the pockets, the garment's finest trait is the ease with which the full-length zip can be manouevred up and down with one hand while fending off stupidly dressed roadside fans with the other. i see this as yet another feather in my cap when surreptitiously sitting in for the unfortunate mr valverde.